Browse: Home / ExifTool – Read and write metadata information in files. ExifTool – Read and write metadata information in files. various manufacturers such as Canon, Casio, DJI, FLIR, FujiFilm, GE, HP, JVC/Victor, Kodak, Leaf, Minolta/Konica-Minolta, Nikon, Nintendo, Olympus/Epson, Panasonic/Leica, Pentax/Asahi, Phase One, Reconyx, Ricoh, Samsung, Sanyo, Sigma/Foveon and Sony. Linux wget https://sno.phy.queensu.ca/~phil/exiftool/Image-ExifTool-10.86.tar.gz tar xf Image-ExifTool-10.86.tar.gz ./exiftool -t image.jpg Windows Executable: https://sno.phy.queensu.ca/~phil/exiftool/exiftool-10.86.zip Mac OSX: wget https://sno.phy.queensu.ca/~phil/exiftool/ExifTool-10.86.dmg The MacOS package installs the ExifTool command-line application and libraries in /usr/local/bin. 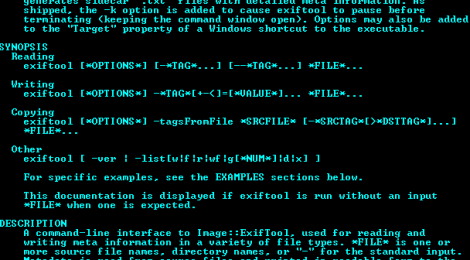 After installing, type "exiftool" in a Terminal window to run exiftool and read the application documentation. The MacOS package installs the ExifTool command-line application and libraries in /usr/local/bin. 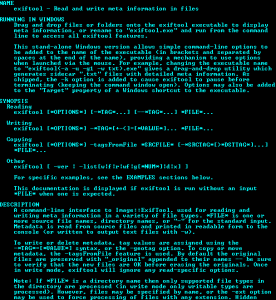 After installing, type "exiftool" in a Terminal window to run exiftool and read the application documentation. ← Internal Monologue Attack: Retrieving NTLM Hash without Mimikatz.